As of 8am this morning, Allistaire has been in the ICU. It is amazing the contrast of 24 hours. Yesterday, she awoke with cheer and joy and her ANC, (absolute neutrophil count), dropped to zero. The ANC is the best indicator of the white blood cells available to fight any and all infection. As of yesterday, she has been utterly without defense. I have heard of what can happen when your body is without its natural ability to fight. Now I have seen it. While I am well versed in much of what has happened to Allistaire over the last three years, todays events have presented a number of challenges she has never faced and are new to my understanding. Those out there who are medically knowledgable will probably find a number of flaws with my explanation, but I am doing my best to piece together what happened when and why and where we are now. I will start by saying that Allistaire is stable. She has never, ever been this sick and never had to be hooked up to so many things. 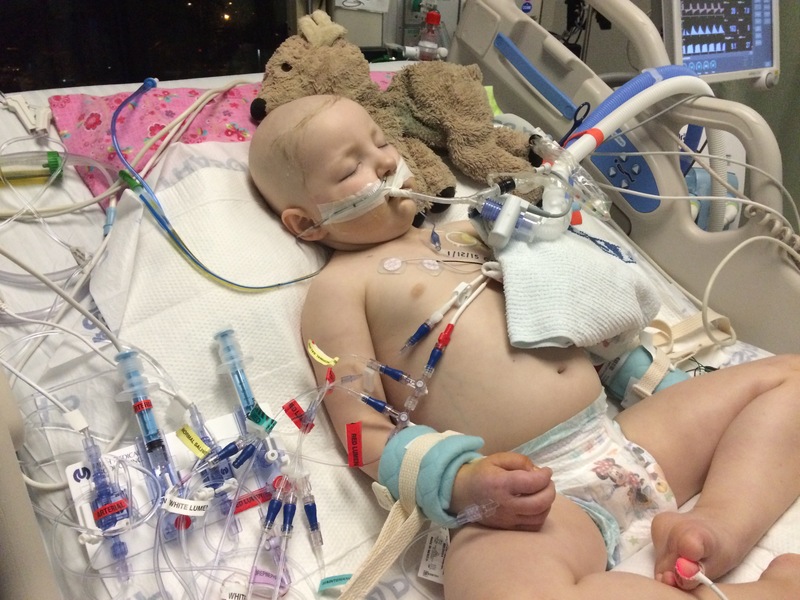 Currently she has 5 med pumps going, a breathing tube attached to the ventilator, three leads on her chest to track heart rate and respiration (breaths per minute), a transducer hooked up to her Hickman line to check her CVP (Central Venus Pressure) which is indicative of the volume of blood moving from the vessels of her body into her heart. If her CVP drops, she may be dehydrated and need more fluid. More on fluids in a moment. Lastly, she has an Art Line, a special line that goes into the artery of her wrist in order to provide constant measures of blood pressure which is much more reliable than the blood pressure cuff. Prior to the Art line being placed, her blood pressures were varying dramatically and were not providing sufficient and accurate info for the medical team to assess and respond. In short, Allistaire has some sort of infection, most likely bacterial. Over the past week since being admitted she has done incredibly well. She never threw up, had an amazing appetite, was drinking so well that once her chemo was complete she was taken off of her IV and had tons of energy. She would bike around the Unit so fast that I would have to constantly remind her to slow down. On Thursday her appetite started to wane a bit and I was not surprised on Friday morning to learn that her ANC had hit zero. She threw up her breakfast that morning but was overall fine. Friday evening she began complaining of abdominal pain. I assumed that she probably was beginning to have abdominal cramping from diarrhea as she did the last round of chemo. However, around midnight, she spiked a fever which prompted the nurse to draw blood cultures which looks for any bacteria growing in the blood. Her heart rate was high (170-180s) and so she was given a bolus of fluids, assuming she was likely a little dehydrated. She was given two more boluses due to her heart rate remaining high and then a dose of Dilaudid to address the pain in her belly. The hospital protocol requires a Rapid Response Team if three boluses of fluid are required in a set (relatively short), period of time. This results in the patient being sent to the ICU. Additionally, the Dilaudid caused her blood pressure to drop. For the past three years, this very scenario has been described to me. I have been told countless times that kids are resilient and look really great even in the face of illness until suddenly they can no longer compensate and it all starts to fall apart. Due to the nature of the chemotherapy used to treat Acute Myeloid Leukemia, the patients bone marrow is completely suppressed, resulting in neutropenia. The truth is, they can be very sick and you can’t even readily tell because their immune system may not be able to mount much of a defense. For these reasons, kids treated for AML are kept inpatient far more while they neutrophils are so low and why we are required to go no further than 30 minutes from the hospital. 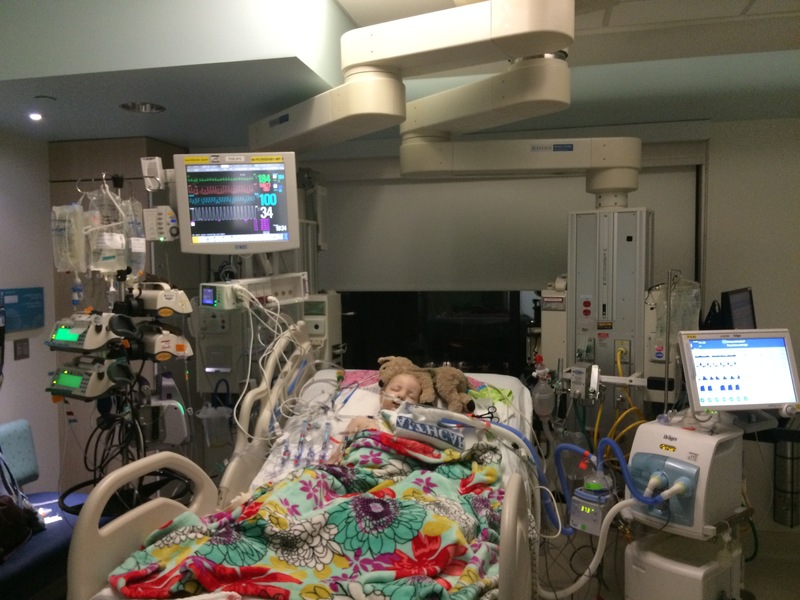 When Allistaire arrived in the PICU (Pediatric ICU), she was breathing very rapidly (about 100 breaths per minute), breathing shallowly, her blood pressures would periodically drop very low (down into the 20s) and she was quite agitated from pain in her tummy which was distended and hard. Her whole body is puffy from fluid. Her body is having an inflammation response to the infection which in turn causes her vessels to be leaky and the fluids to leak out into the surrounding tissues. They continued to give her boluses of fluid and added on Norepinephrine which is a vassal presser to cause the vessels to tighten up and constrict, thus increasing blood pressure. The doctors are referring to her situation as sepsis and that she is in compensated shock. The primary goals are to address the bacterial infection itself and to assist her body in its great effort to respond to the infection by supporting her in a variety of ways. The primary tasks were to get a more reliable means of obtaining blood pressures, aiding with her breathing, determine the state of her heart in response to all the fluid, to provide broad, sufficient antibiotic coverage and to determine by CT, what was going on in her gut. In order to get a CT (Cat Scan), she needed to drink oral contrast which would then take two hours to move through her system. While this was being accomplished, an Echocardiogram of her heart was ordered and discussion began on how the best ways to determine her blood pressure. First a transducer was set up with her Hickman line in order to determine her Central Venus Pressure. Initially this was not working properly and the decision was made to go ahead with prepping to insert an Art line. It was also decided to put her on a CPAP machine which would more forcefully blow air into her lungs which would not only provide oxygen but also help keep her airways open. In the midst of this time, she had her Echo conducted. It took some work to get her set up and stabilized to be able to transport to radiology for her CT. Once she returned from radiology, everyone was prepping for CPAP and the insertion of the Art line. Right about the time they were ready to proceed, Allistaire threw up. Throughout the day, the attending PICU doc had discussed with me the possibility that Allistaire may at some point need to be intubated which means a breathing tube is inserted down her throat and attached to a ventilator which would ease her body’s burden and breath for her. At one point the doctor noted how long Allistaire has been sick (as in the last 3 + years) and said that it was really our choice if we wanted to move forward with this intervention. She was implying that we did not have to continue to intervene if it was just too much. To be fair, she had never seen Allistaire outside of this setting and while I found the option appalling and repugnant, I think she was ethically trying to make our options clear. It was a hard moment. I also asked her if I should have Sten come out. She said that while she does not anticipate this being the case and that it is highly unlikely, it could come to the point that they would not be able to extubate her which would mean that our time to ever talk to her again could be limited. This was when I called Sten to look at flights and see when he could come. I had no time to explain to him what was happening only that he should come. After researching the options, he and his mom and Solveig began driving to Billings so that he could fly out to Seattle on the 6am flight and be here by 7:30 Sunday morning. Once Allistaire threw up, the doctors decided it would be safest for Allistaire if they were to go ahead and intubate her. The concern was that if she threw up while on CPAP, she could aspirate (throw up go into her lungs and cause damage), where as if she aspirates on the ventilator (which she later did), it would be caught by the “balloon” in the breathing tube and to then be suctioned off. Additionally, an NG tube or a Salem Sump, was inserted into her nose in order to pull out anything in her stomach including fluid and gas. The plan throughout the day continued to change as new information was gained. Results from the echo showed that her shortening fraction had dropped from 32 to 20. The increase of fluids was also causing her heart to be more floppy and less able to constrict. This prompted the addition of epinephrine to help her heart muscle contract and in a way, counterbalance the effects of the norepinephrine. After much preparation, she was sedated (not completely) and they then placed the breathing tube and got that all situated. The doctor then moved onto the insertion of the Art line which was very interesting to watch. He used a small wand with ultrasound to determine the location to best place it. Once it was all set up, he put in a stitch on each side of the line into her hand to secure it into place. For now she is stable, blood pressures are stable and in a good range and she is much more comfortable. They are watching her lactate level which is slightly elevated and can be a sign that her body is still working too hard. The nurse has been able to wean her off both the norepinephrine and the epinephrine. She will continue to be intubated for now and we simply have to wait for the antibiotics to do their job. On Monday, and for the following 6 days, she will be given transfusions of neutrophils. I had no idea that this was possible. A donor, who is HLA matched with Allistaire, will be given a GCSF (Granulocyte Colony Stimulating Factor) shot that will cause their bone marrow to produce and release neutrophils which will be then collected, processed and given to Allistaire. Cool huh?!!! In this midst of this all, Allistaire has done a remarkable job dealing with all the invasion and discomfort. Until she was sedated, her little independent big-girl self, insisted on going to the bathroom in the little potty chair rather than in her diaper. Throughout she has been very cognitively aware and articulate. Her greatest frustration has been not being able to drink (no food or drink for now) and she absolutely HATED the CPAP mask. It drove her nuts to not be able to rub Doggie’s fur up against her nose and such her thumb easily. Even now that she is sedated, she is still doing well. A friend visited and when Allistaire heard her voice, a smile passed her lips. When Solveig said, “Hi Allistaire,” on the phone, Allistaire waved her hand. The hardest part for me is that she can’t talk because of the breathing tube being positioned at her vocal cords. It is so painful for me to watch her trying to talk, to communicate how she is feeling or what she wants and not being able to understand. Thankfully, she is able to communicate yes and no. There have been a few times when her eyes suddenly go wide and she looks afraid. This hurts my heart for my girl, but she is pretty readily calmed. I know my little fighter is in there and her tenacity is serving her well, even if we cannot hear her voice of defiance. Yes it’s been a rough day, but man, this is the first time in three years that we have gotten to this place. That in itself is an amazing provision. I have total confidence in the PICU team and our sweet attending Hem/Onc doctor, Dr. Leger, stopped in multiple times to check in, including at nearly 11pm before she went home to her own family. Allistaire has a lot of support right now but all seems well. I am told that once those neutrophils from the transfusion enter her blood stream, they will go straight to the areas of infection and start to battle. She will likely get sicker before she gets better. There may be a cytokine storm (proteins in blood from cell death). It could get scarier before we see better days, but this is what must come. What gift to have so many people’s brains and experience and persistence come together to care for my sweet girl. I am in awe at all that we are able to do to support this one small life. Oh what gift that so few on this earth have ever known. Life. Life. Beautiful life. And beautiful body, so complex and miraculous. I’m pretty tired and Sten should arrive early in the morning. Lord, thank you that though we cannot foresee how our days will go, from morning to night they may swing dramatically, but you are not caught off guard. You know the days before us. Thank you for your provision of so many amazing people and crazy cool meds that can fight and care for Allistaire. Thank you for that incredibly beautiful little girl that I can only love more every single day! Be strong- the Lord is with you. I am Praying for all of you on a daily basis, I always do not respond, yet I read all the posts and Pray always. Love and Hugs. Praying for that little cutie and her family. There are no words that I can muster as everything sounds so cliche’. You and your family’s strength are amazing. You are exemplifying all the grace and power of our Father in Heaven and his son Jesus Christ . I believe reading this was the reason I popped into Facebook this morning before church. I will be praying for you, for the doctors and of course, sweet Allistaire; for healing, for strength, for grace, for wisdom. We are praying, we are sending peace and comfort. Know that you have my prayers… May you know the comfort and strength of His living hands upholding you. My heart is breaking. Thinking of sweet Allistaire, and all of you during this critical time. I am and have been praying for you all. I’m thankful for you, your beautiful girl and your blog. It strengthens my heart to read it and it reminds me of many wonderful things about our God. I’m praying for Allistaire and your family. Much love, (although we’ve never met) from Lindsay. Thanks for sharing…we’re praying for you guys! Before i read a word, i prayed. These pictures cut deep. I’m holding you close from afar. Praying for continued provision. I recently experienced all of this and more with my little one. I am praying for her, you, your husband and of course for wisdom thru this heartwrenching time. My heart aches for you but also sees the amazing joy you will come to have after this experience. Our journey has changed our lives in such a profound special way that you are right-few others get to experience! Lots of love and prayer for you! Lord have mercy…praying for you all. I can only reply with what has been on my mind all day as I pray for you, Alistair and your family. In Joshua. 3, Good tells the Israelites to follow,’ for they have never been this way before’ . Is that not true of every trial we face? Prayers for the continued, incredible strength He has given you. And for all to see and recognize that this is no ordinary, human strength. Good bless you all with His enduring presence. May Allistair rest DEEPLY between His Shoulders in The Secret Place…Spirit to Spirit…peacefully calm and held by The SAME Everlasting Arms that Embrace and Hold her daddy, mama and sister…ALL Glory to HIM! Praying for all of you…may you feel God’s power and love, especially now. May God give all of you the strength and peace of mind for EACH new day as Allistaire recovers. Jennifer, your posts are so encouraging. Thank you for sharing. We are lifting all of you up in prayer. God Bless all of you! Have never met your little girl but love her and your family so much! We pray for her and The Mason’s share your posts. Thank you for sharing. Sending you and yours strength and holding you in our hearts.